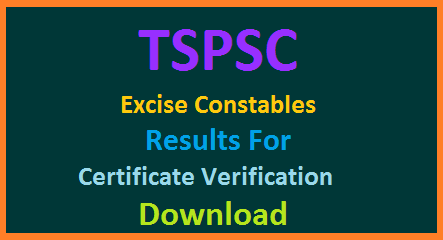 In Continuation of result notification for verification of certificates dated: 29.12.2016,and 14.02.2017,It is hereby informed that on the basis of the Written Examination held on 31/07/2016 to the posts of Prohibition & Excise Constable in Prohibition & Excise Department with the following Register Numbers have been provisionally admitted for the verification of Certificates. Telangana, Backward Classes Welfare (OP) Department, Dt:18/12/2015 (prescribed format hosted on Commission’s website), Certificates relating to claim of age relaxation, Study (from 4th class to 10th class), basic information data (Check List(1set), attestation forms (2 sets) and if any, at the time of verification of documents, failing which, they will not be admitted in subsequent process of selection. No request will be entertained to subsequent submission of any of the above certificates. In terms of the notification, the candidates should possess the requisite qualifications as on date of notification i.e., 30/04/2016. The verification of certificates will be held from 27/01/2018 to 02 /02/2018 at Government Polytechnic College (Sankethika Vidhya Bhavan) MasabtanK, Hyderabad.The candidates are requested to obtain and keep ready all the certificates as mentioned in the Notification. If, on further Verification it is found that any candidate is not eligible with reference to the particulars furnished by him/her in the Application Form / Check List / Certificates, the results of such candidate / candidates shall be cancelled at any stage of selection process. The day wise schedule will be available by 20th January 2018 on TSPSC website.